The multi-watch Deco collection from Michele Watch is one of the brand’s most popular designs! 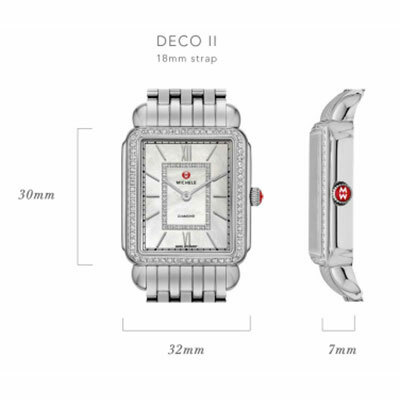 There are four models in all: Signature Deco, Deco II, Deco 16 and Deco Ceramic. They were inspired by the Art Deco period. Each is available in stainless steel, yellow or rose gold plating. Some styles even combine a dynamic duo of precious metal. All feature Swiss movement. A sapphire crystal. And are water-resistant to 50 meters. Diamond bezels are a prominent feature across the line. Colorful faces metallic gold. White and black Mother-of-Pearl. Pink topaz and diamond. Rose gold. Blue peacock feathers. The Signature Deco boasts a Swiss chronograph and day of the week sub-dial. The Deco II is slim and sophisticated. 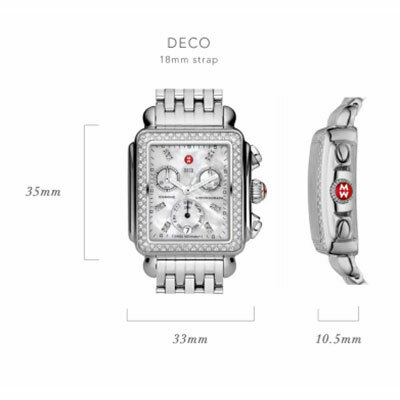 Both of these Deco models accommodate an 18mm bracelet or strap. So does the fresh-looking Deco Ceramic. 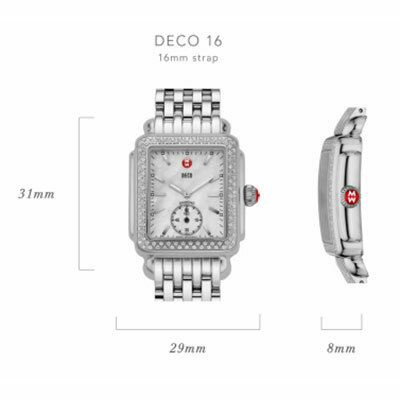 A bracelet or strap measuring 16mm is appropriate for the Deco 16. Change your Deco bracelet or strap with your mood! Or your wardrobe! Pick your color and texture. Shop and repeat! Your Michele Deco watch will take you from day to night. Weekday to weekend.